Home → Game Recaps → May 31 2018: Our First Win of the 2018 Season! Last night vs. North Reading we got our first win. We came from behind three times to take the lead in the top of the 7th, 6-5. Dean Borders made his first start and was impressive going 6 innings. Especially in the first inning with runners on second and third, no outs and two runs in, he struck out the side to get us out of the inning. Nick Menino came in in the 6th and got the last 6 outs striking out 5. Nick is from Swampscott and pitched for Trinity……. We got 9 hits. Tim Cochran drove in the tying run in the top of the 7th with a triple and Tim Unczur knocked him in with single. Co Captain, Trey Blackmer, had 3 hits. Below is Tommy Roundy’s summary of our 2-2 tie vs. Manchester last Saturday. 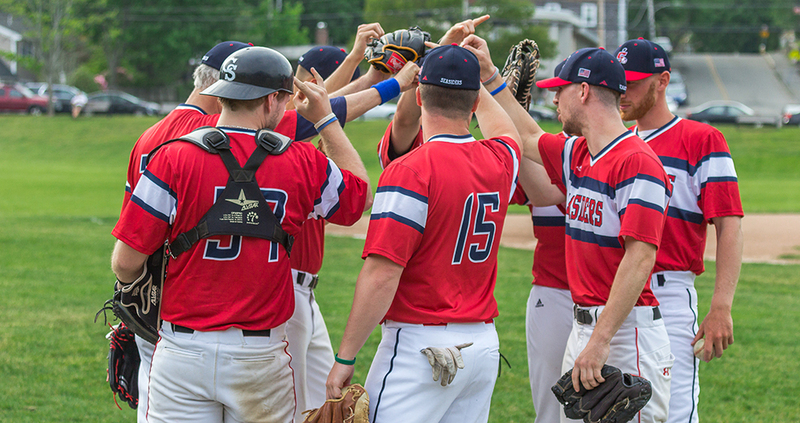 The Marblehead Seasiders begin their third season in the North Shore Baseball League with a 2-2 outcome against the Manchester Marlins at Seaside Park on May 26. The umpires called the game at the end of seven innings due to darkness. The game will be officially listed a tie in the standings. Lefthander Ed Duran went the distance for the Seasiders, striking out eight and scattering six hits. The Seasiders, despite being held hitless for the game, scored a pair of runs in the fifth to take a 2-1 lead. The Marlins tied it in the sixth with a leadoff home run. Shortstop Mike Mitchell and third baseman Tim Unczur make outstanding plays in the field for the home team. An historic highlight of the game occurred when 59-year old Seasider manager Tommy Roundy (pictured above), who last played in the NSBL in 1988 for the Marblehead Yachtsmen, started in right field. Roundy was slotted in right due to a player shortage. In addition to unofficially being considered the oldest known p!ayer to appear in an NSBL game, Roundy recently received a permanent prosthetic for his lower right leg that was removed last June. Ricky Spencer joined us last night. He’s 6-4 and played 4 years at Trinity as a first baseman. I predict he will hit a few out of Seaside. He’s Nick Menino’s roommate. Last night he was our designated hitter and got a hit. Thank you very much to Jim Nye and National Grand Bank, Dr. Roger Wise and Chip Percy of the Three Cod for their generous donations. This Saturday at 5 we will be at Seaside to face last year’s league champions, the Kingston Sox. Hope to see you there.